There is no better symbol of the rise and rise of women's sport. If one person symbolises the incredible transformation in women's sport in Australia over the last couple of years, it's Charlotte Caslick. 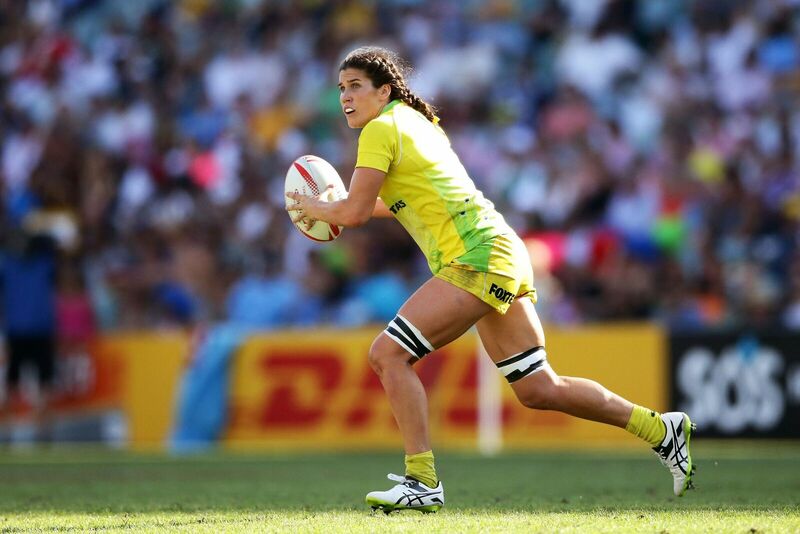 Caslick, you'll recall, was the star of the Aussie sevens rugby team which won the sport's first ever Olympic gold medal at the Rio 2016 Games. She currently makes a good living out of footy, as so many men have for so many years. She's a super talented, super successful, super professional, fabulous female athlete who works closely with rhyming brands (!!) GoPro and the high protein yoghurt YoPro. But you know what really tells the story? It's the schoolboys who want her to watch them play. "At schoolboy events, they know who Lewis (her Partner is Lewis Holland, captain of the men's sevens team) and I are, and all the schoolboys want us to come and watch them," Caslick told HuffPost Australia as we chatted before the start of this season's HSBC world sevens series in Dubai. Think about that for a moment. There's nothing unusual about young schoolboy athletes seeking affirmation from their male heroes. But to seek approval from a female athlete? Like we said, times have changed. And for the better too. "It really is a great time to be a female athlete," Caslick said. "The Jillaroos [Australia's women's rugby league team] are killing it. And look at the Matildas, The Women's Ashes. There's just so much women's sport going on and it's growing so much even from when I started playing rugby." Caslick, 22, is Australia's best sevens rugby player. She's not big-headed, so she might not appreciate us saying that. But this reporter can tell you from first hand experience that at the Rio Olympics, when a big play was needed, Caslick was there to make it. She just seemed to be a little stronger, a little faster, a little smarter than the others. Watching her play, you got this "wow" feeling you only experience when watching the greats. Part of the secret to her success is her healthy training regime, much of which happens on North Narrabeen Beach near her Sydney northern beaches home. You can see clips of that in the video at the top of this story. Charlotte Caslick can definitely jump higher than you. And when she's not at the beach, she'll soon be spending a fair deal of time at the property she and Holland have just put a deposit on in Stanthorpe -- which the weather nerds among you will possibly know is the only town in Queensland that occasionally sees snow. She's got family out there and doesn't mind the idea of being a cattle farmer one day. For now, it's all about rugby. After Dubai, there are back-to-back tournaments for the next six months or so, highlighted by the Sydney sevens in January, which this year fall on the Australia Day long weekend. Two words: party time. Skills and training aside, you know what we really think is key to Caslick's success? It's her attitude. "I love going to training every single day. Going to rugby and running around with my friends is a pretty cool job."